It’s the most wonderful time of the year. I am—well, I guess—I was the grinch. But, not in the obvious ways, and quite honestly this realization came to me as I was walking around my neighborhood looking for a Christmas Tree. I just do not get why I have to express my love to my family and friends during one time of the year. So, as I got older I became more adamant that I wouldn’t do Christmas. Then I become a tad more Afrocentric… and said, “…well, Kwanzaa just makes sense. Why shouldn’t I do this every single day of the year?” No matter how I feel towards the end of the year, I am guaranteed to be among family, friends and rice. Rice is an important staple in Haitian cuisine served at more formal sit down dinners. Rice is served last and by itself, because it should be savored. One of my favorite rice recipes is Riz ak Djon Djon or Rice with Mushrooms. These mushrooms are grown in the north of Haiti. They provide the rice with its black color, and when put together with lima beans they are the perfect meal. I have become obsessed with Riz ak Djon Djon for a few reasons. One, my grandmother makes the best Riz ak Djon Djon. While everyone has that one person in their family that makes amazing dishes for their generation, in my family, my grandmother is the one. None of her children took the responsibility of making the dish at our regular holiday events. As a result, when my grandmother and I were talking, she said I should learn the recipe. So here I am. I am going to share the general recipe with you all. Prep: You will have to get at least one to two bags (which should be approximately one pound) of Djon Djon mushrooms (found in Haitian supermarkets or in your Haitian neighborhood). First, You want to soak or boil the mushrooms in 3-1/2 cups of water so they can develop a nice dark color, and that same water will be used to make the rice. You should set at least 20 to 25 minutes to soak or boil mushrooms. Remove and discard the mushrooms. Using a fine-sieve, strain and save the mushroom liquid over a medium size bowl. Discard the sediment left behind in the sieve. 1. Mash approximately 6 garlic cloves, 1 parsley sprig and 1 Maggi cube (seasoning which is optional, but many people do use it. It can be found at most markets near the Goya, Caribbean or Latino sections). 2. Fry in the pot where you will be making rice. Feel free to use olive oil. 3. Cut up one onion, half a green pepper, and one peeled tomato [cooking note: Whenever I need to peel a tomato, I have to blanch it first. do you have process for prepping the tomato?]. Continue to sauté vegetables in the pot until the vegetables are slightly wilted. 4. At this time, put in 16 oz. of frozen, small lima beans, and let the ingredients sauté for a few minutes. 5. Pour 3-1/2 cups of the strained mushroom water in the same pot as the vegetables and bring to a boil. Put approximately 6 cups white basmati rice in the boiling water, and continue to cook evenly until prepared. It will take approximately 20-25 minutes to cook and the pot should be covered the entire time. 6. Cool slightly before serving, and you are ready to eat. Note: We usually make this for many people. I would suggest starting with a 2 to 1 ratio for your home. 2 cups water to 1 cup rice. I hope that one day my grandmother will tell me that I have nailed the recipe. Until then, I keep trying. A bit about Lodz Joseph. She like to write about domestic and international travel; you can find her at The Chronicles of Travelling Womanists. She has just started to write about her health journey at Our Life Project. You can find her in Brooklyn on her bike, unless it is too cold. Follow her on Twitter @lodzjoseph and Facebook. 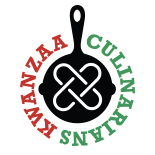 This entry was posted on December 9, 2012 by Kwanzaa Culinarians in 2012, Personal Story and tagged Djon Djon Mushrooms, Haitian Rice, Lodz Joseph, Riz ak Djon Djon.